Maleficent is so powerful, so fearsome, and just so...maleficent! Her whimsical fairy tale name describes her pretty well. But, is she really all that bad, or is she just not someone you should tick off? Try on this Black Maleficent Gown Costume, and see for yourself what having all that power feels like. This dark fairy tale is nothing we all haven't heard about before. Girl meets boy, boy and girl fall in love, boy tries to kill girl so he can be king, girl uses fairy magic to drive boy(now king) to the brink of madness. Seriously, if we hear about one more king or queen getting into a lover's spat with a fairy, our heads are gonna spin! But, we have to side with Maleficent on this one. She was just defending her home turf from a king that bit off more than he could chew, and then she got her revenge when they stabbed her in back. She also happened to look pretty stylish while she did it, which makes us root for her even harder. What makes Maleficent's ensemble so enchanting is that while it is darker in style, it doesn't necessarily look evil, like how many other macabre-looking costumes tend to. 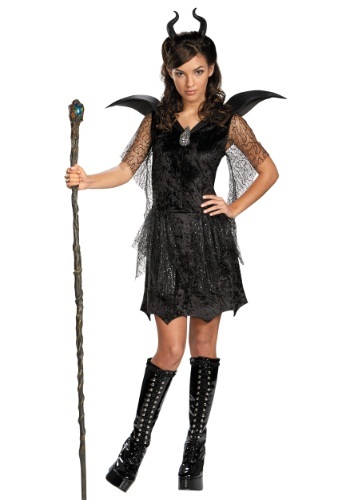 When you're wearing this costume gown, you'll give off a dominating vibe, but also be mystical and mysterious. The black dress and lacy overlay lets you look brooding and cute at the same time, while the wings and horned headpiece let you show off your magical side. Hopefully, nobody breaks your heart while you're wearing this wickedly fabulous gown. But if they do, you can't say you didn't warn them!